In this post I will cover some of the nitty-gritty information to outline how I got about evaluating the emergency medical care (EMC) aspect of prepping. I will touch on EMC layers, EMC mission, different requirements/restrictions, and end this post talking about different carrying methods for your first aid kits. In the previous post I introduced this topic (MEDICAL CARE: Introduction), emergency medical care in a prepper environment. I quickly reviewed the SABCT of rendering medical care. I also touched on the importance of Situational Awareness (SA) while rendering emergency medical care in the field. Note: Each kit “adds on” to the kit at the previous level, it doesn’t replace it. You still carry all the lower level kits. 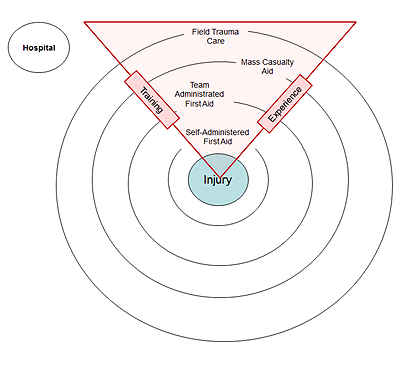 This all has to be seen in the context of the skill level of the person(s) providing the emergency medical care. The goal should be to accomplish those four tasks until the next level of medical care can be provided to the patient. In other words, a first aid responder gives aid until an EMT shows up. The EMT provides care until a Paramedic shows up. And the Paramedic provides medical care until a doctor can take over. Each care giver provides emergency medical care based on their skill level and assumes the next care level is available. However, that concept is in a perfect world, and during emergencies you rarely find “perfection” or anything similar to it. So be prepared to do the very best you can even if that is above your skill level. 1. Each kit item must have a specific purpose to meet the four mission elements mentioned above. 2. All contents must be essential to the skill level associated with the kit. 3. All contents must be useful to skill levels for all higher level kits/skills. 4. Contents must be readily identifiable for their intended purposes. 5. Contents must be easily handled (i.e. removed, opened, etc.) in emergency situations. 6. Kit must be readily accessible to the medical responder or to others; preferably worn or carried on the outside of the person. 7. Kit must be durable, pliable/flexible, provide plenty of storage options, and easy to transport. 1. Kits will not be a “hard case”, no plastic cases. 2. Contents of each kit must have a specific purpose. 3. Kit contents must not be “breakable”, such as glass. To me this is a very important issue. I spent a couple of decades working the streets as a firefighter. During that time I expended considerable time providing medical care. One thing I found out for sure – if it can break, it will. I have had oxygen units fall apart on me, medical bag zippers jam, plastic medical boxes break apart, and all sorts of other embarrassing and care delaying problems occur. One of the last things you need is for your first aid kit is to get destroyed, break, zipper jam, carry strap break, carry handle break, or other fatality inducing accidents to occur. 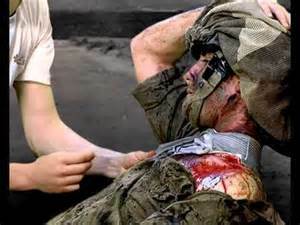 To help avoid those situations I have found that military gear, specifically pouches and bags, to be the best method of carrying your precious emergency medical care items. Military gear has proven to be rugged, durable, useful, adaptable, flexible, and easy to use under stress. So you will see each one of my medical kits is based on a military (or equivalent) carry method.